The early Christian Church was a chaos of contending beliefs. Some groups of Christians claimed that there was not one God but two or twelve or thirty. Some believed that the world had not been created by God but by a lesser, ignorant deity. Certain sects maintained that Jesus was human but not divine, while others said he was divine but not human. 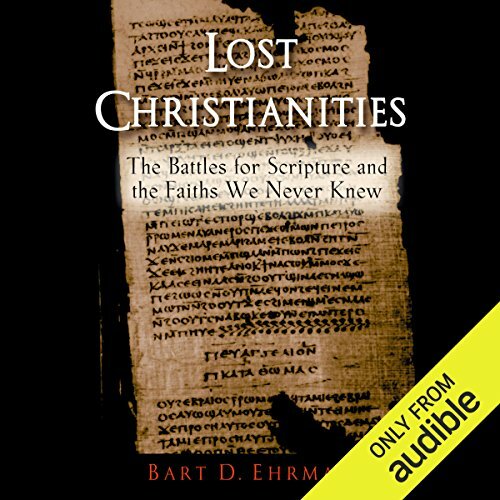 In Lost Christianities, Bart D. Ehrman offers a fascinating look at these early forms of Christianity and shows how they came to be suppressed, reformed, or forgotten. All of these groups insisted that they upheld the teachings of Jesus and his apostles, and they all possessed writings that bore out their claims, books reputedly produced by Jesus's own followers. 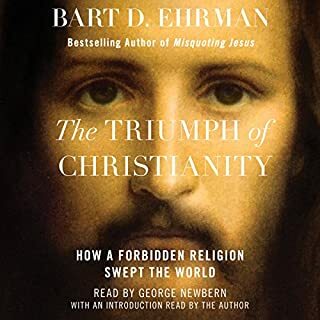 Modern archaeological work has recovered a number of key texts, and as Ehrman shows, these spectacular discoveries reveal religious diversity that says much about the ways in which history gets written by the winners. 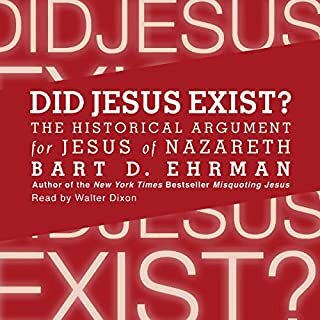 Ehrman's discussion ranges from considerations of various "lost scriptures" - including forged gospels supposedly written by Simon Peter, Jesus's closest disciple, and Judas Thomas, Jesus's alleged twin brother - to the disparate beliefs of such groups as the Jewish-Christian Ebionites, the anti-Jewish Marcionites, and various "Gnostic" sects. 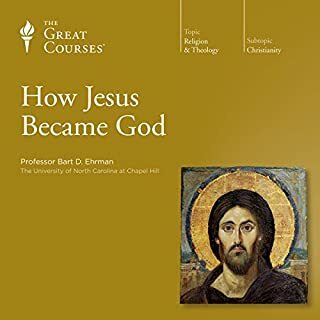 Ehrman examines in depth the battles that raged between "proto-orthodox Christians" - those who eventually compiled the canonical books of the New Testament and standardized Christian belief - and the groups they denounced as heretics and ultimately overcame. Scrupulously researched and lucidly written, Lost Christianities is an eye-opening account of politics, power, and the clash of ideas among Christians in the decades before one group came to see its views prevail. ©2003 Oxford University Press (P)2013 Audible, Inc. 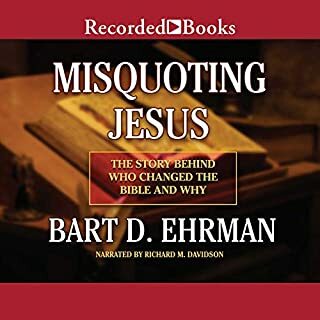 While I enjoyed Bart Ehrman's Misquoting Jesus, I think I like this one was even better. Here we are taken through a tour of the first generations following the death of Jesus and the many forms of Christianity that they practiced. He discusses why some flourished (able to claim ties to the antiquity of the Hebrew scriptures) and why some sects floundered (disagreements over the role of women.) It was very easy to follow along and see how each event contributed to the scripture and the forms of Christianity that have been handed down to us today. I was just as fascinated with the stuff that almost made it into the New Testament (letters from Clement, Titus for example) as those that did. 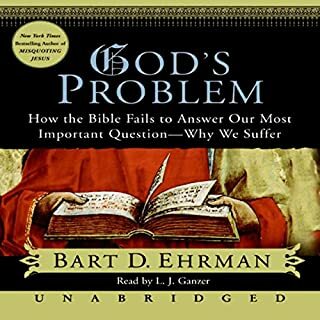 Ehrman goes on to provide a clear context to understand the books of the Apocrypha as well. A lot of verses I never understood before suddenly made perfect sense when I was oriented in the right cultural beliefs. For example, in the Gospel of Thomas (alleged to have been written by Didamus Judas Thomas, Jesus's twin, but debunked by scholars) it says that women must become men to reach the Kingdom of God, Ehrman explains that Neo Platonists did not see the human race as having two genders, but only one. Ancients believed that women were males who never developed properly! Needless to say, that had never occurred to me. Suddenly, all became clear. While this book may be too introductory for experts, it was fascinating to a lay person like me. Recommend. A great reader, subject matter is interesting, at times a bit boring, still a worthwhile listen. I thought this book was quite good. I, as a person who believes in Christianity intellectually, found myself agreeing with him on many points; however, his conclusions were the parts of this particular book that I found myself to be at ods with. I learned a great deal from this book and recommend it to those who are interested in studying early Christianities. His description of the gnostics helped me gain a deeper understanding and appreciation for them that I did not even close to have before reading this book. we forget that Christianity has changed considerably over time. some ideas come back into style after an era. Just like many people, the formation of the New Testament (what was lost, what was kept, what was heretical, how the Nag Hammadi texts relate, how the Dead Sea Scrolls relate, and how much was revised from the first century) motivates me to look for current scholarship. I was so happy to find the books by Ehrmann. Because of the controversies involved, I assess authors for not only what they claim as their orientation, I feel for the quality of an author's pulse. Is it thready but with a thesis? Is it random and irregular? Is it bounding towards an aim? I cannot say I am clear with Ehrmann yet. My choices: he might be aiming to discredit all the gospels to bring down the Abrahamic faiths; he might be looking to convince himself of a new Listopia of gospels to build a New New Testament; he might be motivated to reconcile his own conflicted faith. Because, after diving into three of Ehrmann's books, I have not yet determined his motives, I have to say that the books feel like they lack a thesis. That makes them a collection of details. Sometimes, the details are painfully boring. Sometimes they are organized topically like notes for a research paper. Other times, he illuminates brief passages of forgotten books that I wanted to know more about. He has introduced me to new words, such as Doceitic and Marcionism. However, I am worried about quality. In my reading, I long ago learned that the Hebrew Bible was called the Tanakh. I was shocked when he equated the Hebrew Bible with the Pentateuch with the Torah as synonyms! This man claims to be an authority on scriptures! The Torah and the Pentateuch are simply the first five books of the Hebrew Bible or the Christian Old Testament; the Tanakh would be the term to better describe the more comprehensive "Hebrew Bible," or Christian Old Testament. I recently reviewed this while studying the Samaritans, a different sect who use only the Torah and have done so since the Assyrians arrived in the Levant. So, the Samaritans certainly dove-tail back into this scripture topic as they are mentioned in the Christian New Testament. A scholar would know this! After noticing this error, I have been worried about the accuracy of the research. I do plan to continue with the Ehrmann books on my list, but I am more worried about accuracy than before. 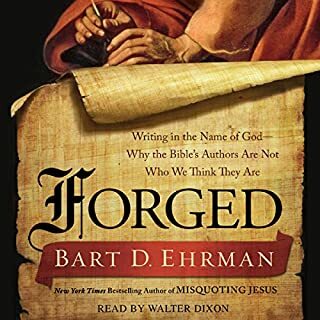 I also have a problem with how Ehrmann is interpreting forgeries; just because a text was lost, forgotten, destroyed, or beheld as valid only by a minority does not make that text heretical or a forgery. Ehrmann may not mean to imply that, but his language's lack of precision otherwise leaves me with that conclusion. It seems the New Testament books were built in a Darwinian method, survival of the fittest as rated by those with the most clout and editing skills; true inspirational treasures from our corporate human experience are likely lost, neglected, forgotten, torched. Read with caution. Very revealing, and enjoyable book. Thank you for creating it for us to read. Going to read this one a few times. After listening to other books on the subjects, the information and the instructor are not very good at holding my attention. The information is good. It absolutely sounds like a college lecture hall but not very dynamic or energetic, just the info being given. Can not recommend for the following reasons. This compilation of “ancient texts” is an obvious attempt to weave a modern liberal doctrine. To sprinkle doubt and subterfuge amongst the faithful Orthadox of Christianity..
Mingled amongst these ancient texts, the author inserts confusion, doubt, and dances around the fires of heresy . I can not recommend this work of deceit.